Water, Cetyl Alcohol, PPG 15 Stearyl Ether, Polyethylene, Glycolic Acid, Glycerin, Steareth 21, C12 15 Alkyl Lactate, Cetyl Lactate, BHT, Neopentyl Glycol, Dicaprylate/Dicaprate, Cocamidopropyl PG-Dimonium Chloride Phosphate, Disodium EDTA, Xanthan Gum, Sodium Benzotriazole Butylphenol Sulfonate, Sodium Hydroxide, Agar, Menthol, Benzalkonium Chloride, Iron Dioxide, Mica, Red 40 Lake (CI 16035), Red 30 (CI 73360), Yellow 5 Lake, Titanium Dioxide, Fragrance, Polysorbate 60. 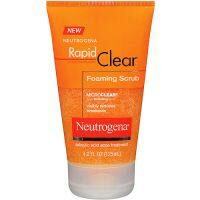 Usually when I use an acne product it works for a certain amount of time and then just stops working altogether. However, out of all the products i've used, it has worked consistently for the longest amount of time.